Versailles volleyball coach Kenzie Bruggeman (far left) talks to her players after an intense practice on Tuesday. 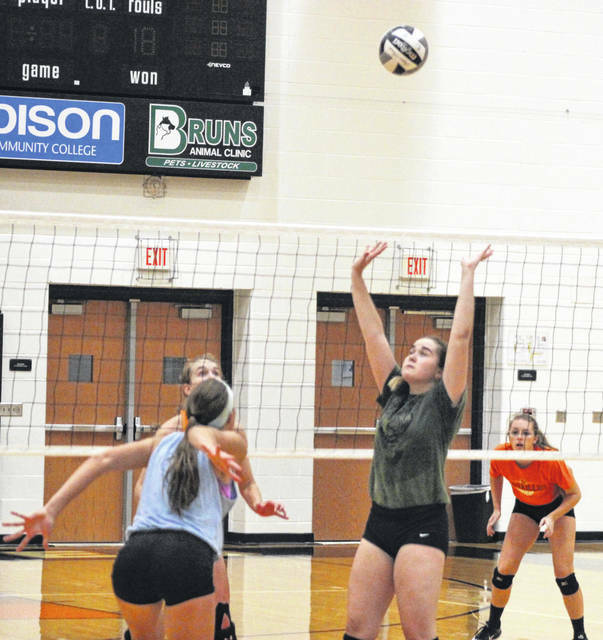 The Tigers are the defending Division III state volleyball champions and are gunning for a repeat title run, but will have to do it with many new faces on the court this season. Versailles senior Elizabeth Ording (left in red shirt) goes for a smash during practice on Tuesday in the VHS gymnasium. Ording is one of four seniors trying to lead this team to a second straight Division III state title. Versailles senior Kelsey Custenborder sets up the ball for junior Lindsey Winner (light blue shirt) during practice on Tuesday. The Tigers are working hard in an effort to win a second straight Division III state volleyball championship. 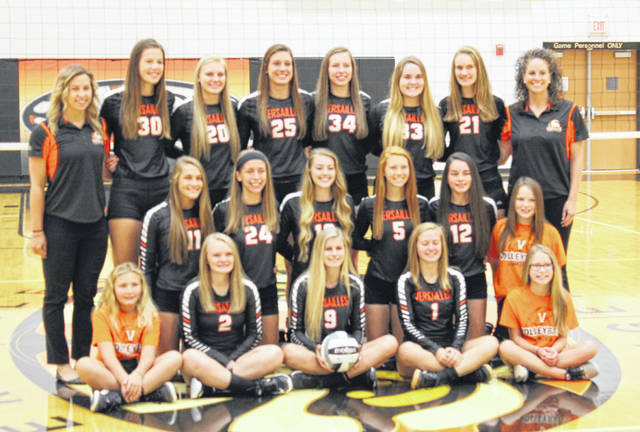 The 2018 Versailles Tigers volleyball team. VERSAILLES – The 2017 Division III state volleyball championship banner hangs above in the Versailles High School gymnasium. It was a magical season for the Tigers a year ago, but that’s just it. It was a year ago. Now that the 2018 season is underway, this year’s team doesn’t reflect much on last year’s triumphant season. Don’t misunderstand though. They are all extremely proud of the accomplishment and the experiences they had, but the 2018 season brings new players, new challenges and a new goal for the Tigers. 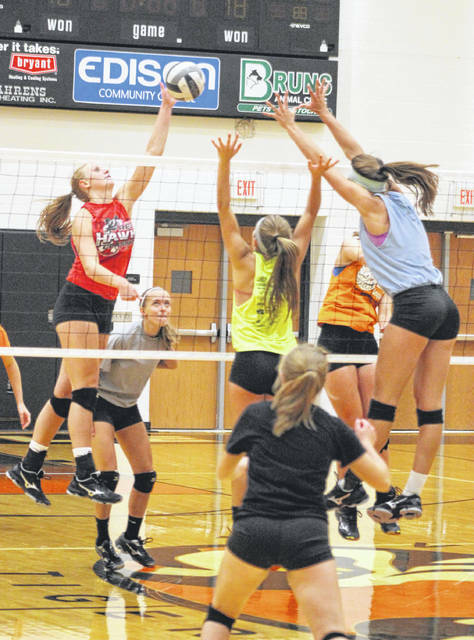 “It was a super great time last year,” said VHS volleyball coach Kenzie Bruggeman. “I thought we put in a lot of work throughout the entire season last year. We didn’t really look at the wins and losses so much, but we looked more at how we were performing as a team and what we were doing on our side. Once we only focused on that we started making bigger gains in a shorter amount of time and by the time we got to the tournament we were playing our best ball. Bruggeman will lean on her four seniors this year that were part of last year’s state title run. Elizabeth Ording, Kelsey Custenborder, Alexis Didier and Paige Platfoot are all stepping into those leadership roles along with several underclassmen who were part of the championship as well. Among them are Lindsey Winner and Caitlin McEldowney, both juniors. “It feels great coming in to this season after winning state last year,” Ording said. “But this year is an opportunity to start fresh with a new team coming in and I am excited to see what potential we have. Custenborder and Didier have similar feelings. “Our focus this year is that you don’t get everything handed to you,” Didier said. “Winning the state title last year was pretty awesome and I want to do it again this year because it is our senior year. I’m sure it is everyone’s goal to make it to the state championship, but obviously you have to work for it. Custenborder said there is a heavier focus on working together this season. This season began well enough for the Tigers, who are currently 4-2 overall. Wins have come against St. Marys Memorial, St. Henry, Anna and Covington. They lost in the Coldwater Spikeoff tournament finals to Ottawa-Glandorf and then last week dropped one to Russia. After practice on Tuesday, Bruggeman said it was evident Russia came to play that day. Practices are generally intense in the VHS gym, she said noting that Tuesday’s are called “Competition Tuesdays” for a reason. “Practices are meant to be harder and more mentally draining than what games are so that when we are in a game situation, not that it seems easy, but you just know that you have been prepared,” Bruggeman said. “Today is a little more intense because it is Competition Tuesday, which is meant to get us riled up and get the energy high. This entry was tagged Division III volleyball state champions, MAC, Versailles Tigers. Bookmark the permalink.